The Aqua Lung Axiom is a jacket style BCD that has been introduced to the market years ago. It has since then been has been available now for a few years. It is available with two different inflation systems. You can either use the Aqualung i3 or the Powerline system. 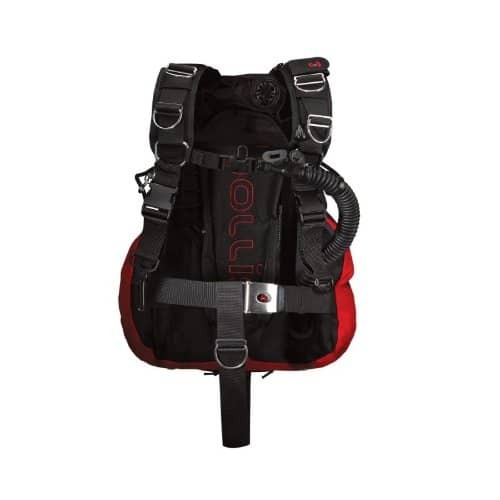 The BCD has an easy-to-adjust harness and is built solidly with high quality materials. The tank attachment is easy and works well. Additionally, you get reasonably large pockets and a large number of D-rings to attach additional accessories. Good price. Version with i3 System is more expensive. Being a jacket system makes it overall bulky. The Aqua Lung Axiom is one of the best jacket style BCD's around. It comes with an excellent harness that provides a lot of options to adjust and find the perfect fit. You can get it with two different inflation systems and in seven different sizes. Overall you can't go wrong with this BCD as a recreational diver! The Aqua Lung Axiom has been available now for a few years. It is available with an i3 inflation system as well as the Powerline system that is used by Aqua Lung. The i3 system uses a convenient lever mounted on the side to inflate or deflate the air cell. The Powerline setup is designed like a classic inflation system coming over the shoulder and connecting to your tank. The mouthpiece on the i3 system is something to get used to but otherwise it’s a great and efficient system to have! The Axiom has been constantly improved over the years and is still one of the best and most comfortable BC’s around. It is a weight integrated jacket BCD. It is a very comfortable jacket BCD that provides great comfort and fit. It offers Aqualungs proprietary Wrapture Harness System. It offers a swivel buckle harness. It also has an adjustable sternum strap so you can find the optimal fit. The integrated SureLock II weight system can handle weights up to 30 pounds. In addition you have 10 pounds of non-ditchable weight for trim in the back. The SureLock II integrated weight system had been recalled years ago but it is safe in today’s version! The BC has a specific air cell design. The result is one of the most streamlined jacket BCD’s you can get. The valves are flat and have a low profile to reduce drag in the water. During deflation the sides of the bladder are pulled in to optimize drag and keep the BC streamlined. The BC offers three pockets for storage. Two close with a zipper. In addition there are numerous D-rings available to attach additional dive accessories. A great features of this BCD is that it is offered in a whopping 7 (!) different sizes. There’s practically no chance that there’s not a size that fits you! Besides all the features already mentioned you also get an octo holder and Aqua Lungs GripLock tank band. The harness can be adjusted to provide the perfect fit and the Wrapture system makes it easy to prevent the tank from riding up to the surface while also keeping it close to your center of gravity. The weight is transferred to your hips so you can stand up straight in comfort. The i3 system to inflate or deflate the Axiom is a unique system. It combines the usage for inflation and deflation into a single lever. It is positioned on the side where you can easily reach it. The deflate position on the lever opens up the exhaust valves to deflate the air bladder. These valves are designed flat to have a low profile and reduce drag under water. The lever is sensitive to allow you to make very find adjustments if needed. The position of the lever need some getting used to but you’ll soon find out that it’s very conveniently located on the side. The i3 system comes with an oral inflator that is positioned over the shoulder. You want to familiarize yourself with it. While you usually won’t use it, it is essential that you know your gear and as such know how to use it! The Powerline inflation system is definitely more what you know from other BC’s. It sits on your left shoulder and connects to your tank with a standard low-pressure hose. The system is very reliable and easy to use. Beginners will prefer it as it is similar to inflation/deflation systems you will find on BC’s from other brands. It also is around $100 cheaper than the i3 system. The Axiom has three pockets. Two of them close with a zipper. One is a small pocket inside a pocket to allow to store personal belongings. The two pockets are large enough to allow to store some small dive accessories like a dive light, etc. You can probably fit dive gloves in there also if needed. The BC provides quite a few D-Rings to use to attach dive accessories to it. It has 5 stainless steel D-rings as attachment points. In addition you get one (Powerline system) or 2 (i3 system) plastic D-rings to use for additional attachments. Lastly, the BCD has a convenient knife attachment point on the left lobe. It’s designed to accommodate a variety of Aqualung knives. The harness system of the Axiom allows for easy adjustments. You’ll be able to find the perfect fit through adjusting the various straps. The Wrapture harness system allows a comfortable fit and weight distribution above and under water. You can stand straight above water while the tank is kept tight to your center of gravity. Under water the GripLock tank band makes sure that the tank stays in its optimal position. The jacket is comfortable and sturdy. Being a jacket style BCD makes it somewhat bulky and not the best choice if you want to travel with it. The swiveling connector of the shoulder straps make it easy to rotate the straps into the right position. This helps to find the perfect position of the harness and the jacket. Best pricing for the Aqua Lung Axiom BCD online and most likely on Amazon. You can find all seven sizes there to get the perfect one for you. There are also a number of combination packages with dive computers, etc. available on Amazon. Have a look to save yourself a bunch of money. There are overall only positive ratings of people having bought this BCD. As a recreational diver, this is one of the best pieces of dive gear you can get that will last you for years to come! 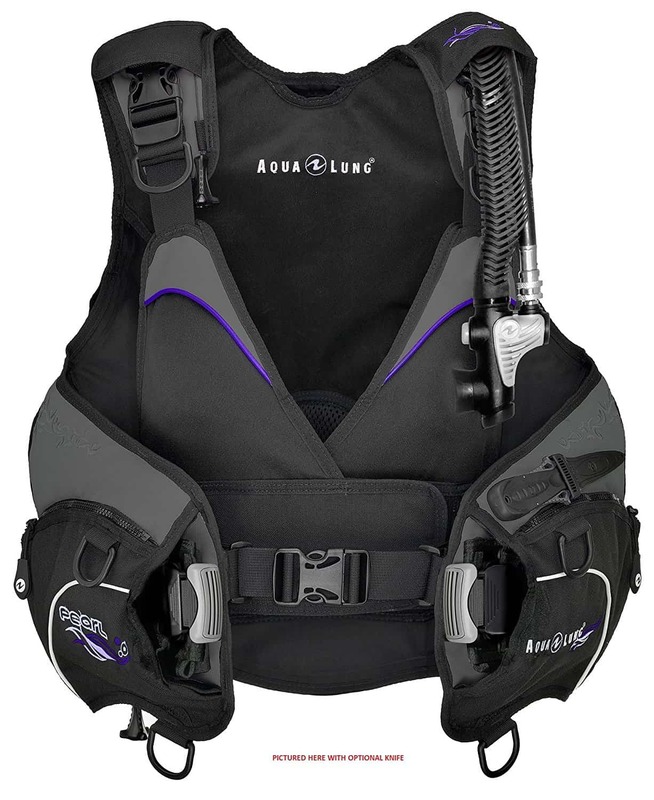 There’s not many other BCD’s for recreational divers that are as comfortable and easy to use as the Aqualung Axiom. The streamlined design helps when you’re under water. There’s not much bad to say about this BC. It’s built sturdy and it has been on the market (with improvements) for a few years now. It’s simply one of the best jacket style BCD’s you can get and is a great choice for a recreational diver! 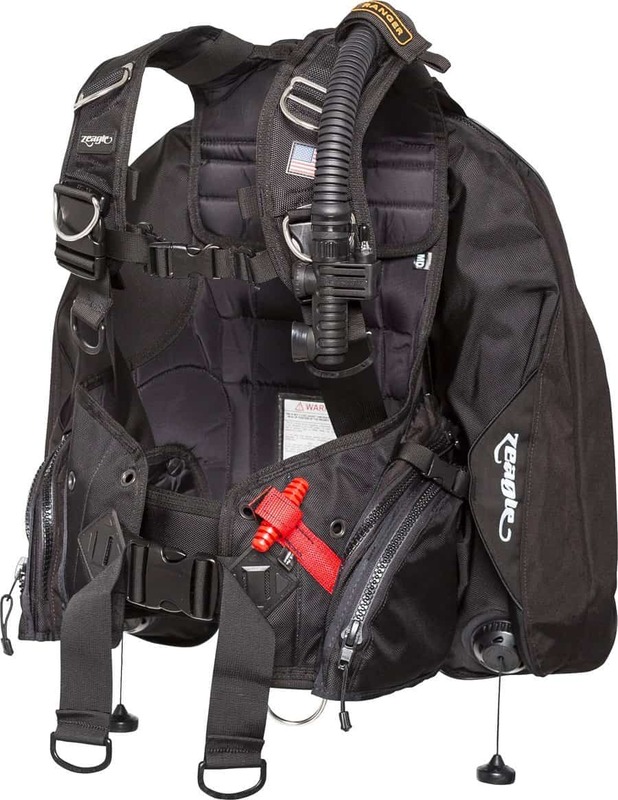 The Zeagle Ranger BCD is the most copied buoyancy compensator in history. It was the first to combine heavy duty construction with highest quality materials and packed weight integration and back inflation into the mix. 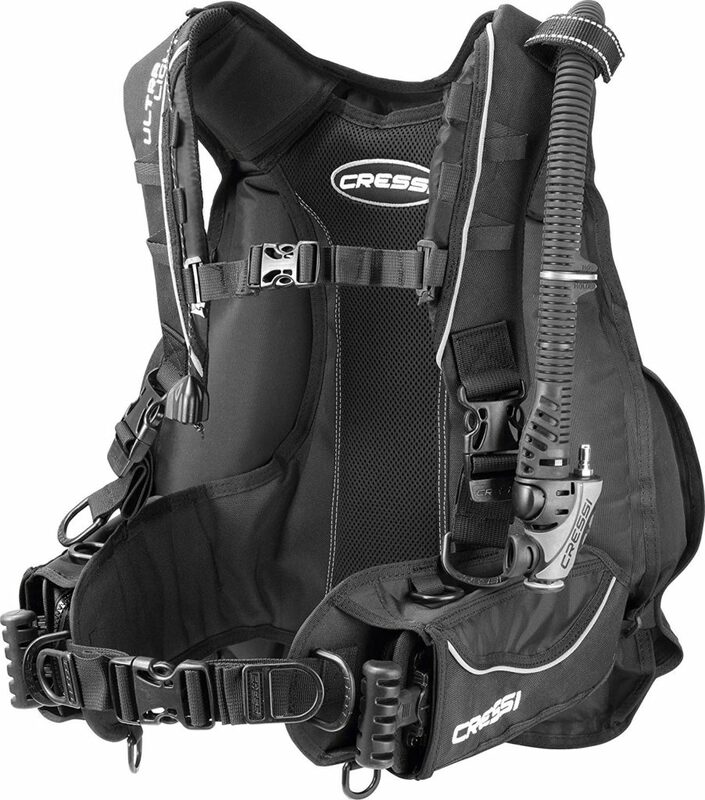 It’s a very versatile BCD that you’ll be able to use for pretty much any kind of diving. While it’s not overly heavy at 8.4 pounds dry, it’s a little bulky. If you’re looking for a travel BCD then this might not be your best choice. 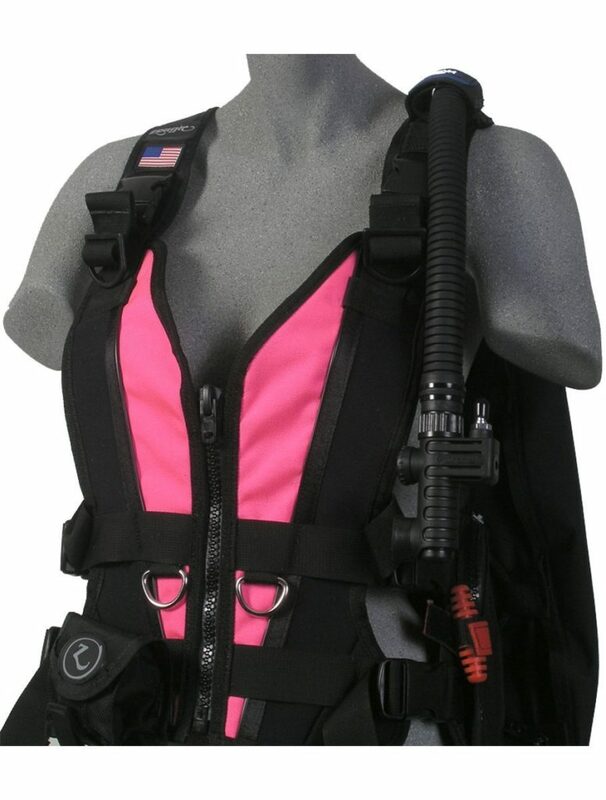 However, pretty much any other use you have for a BCD and this one fits the bill! Easy to use with lots of variability. Reasonably priced for the quality and sturdiness you get. The Zeagle Ranger BCD might just be one of the best back inflate BCD’s you can find. It combines great materials with rock-solid design and superb weight management. There’s really nothing to find that you wouldn’t like on this BCD. The only exception is if you travel a lot. Then it might be a little bulky to carry around. Otherwise, you won’t go wrong with this BCD! The Zeagle Ranger has no particular best use. It excels under pretty much any condition and can be setup and used for nearly any kind of diving. The air bladder is in the back. It can produce a lift capacity of up to 44 pounds. The standard weight system has pockets with a rip cord release. You can add 30 pounds of weights to the BCD. Lastly, you also have integrated trim weight on the back that you can fill up to 20 pounds. There’s also a lot of storage space available in this BCD. The storage pockets are zippered and easy to reach. Additionally, you have six metal D-rings available to attach additional accessories. 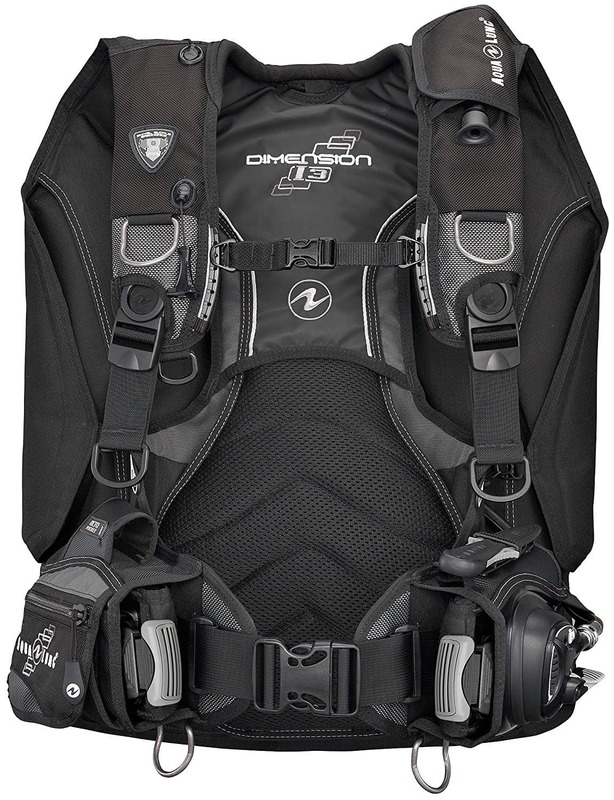 This BCD has a lift capacity of 44 lbs. It weighs 8.4 lbs. dry. However, even though it’s not that heavy, you can’t fold it over or otherwise squeeze it into a travel bag easily. The Ranger integrates the BX power inflation system from Zeagle. It’s easy and reliable and considered one of the best inflation systems available. The single bladder is in the back and provides 44 pounds of lift. However, the Ranger can be reconfigured and you can instead use a dual bladder system in the back with up to 2 times 85 pounds of lift! The BX Power Inflator makes it easy to clean out the bladder. You can simply attach a garden hose and wash the bladder out. You can easily attach the inflator system to your first stage regulator through the 3/8” low pressure connector. It’s a quick connect system that makes it easy to attach and remove the inflation system from the regulator. The Ranger has two large utility pockets on the size. They close with zippers and are roomy enough to keep small dive accessories like dive lights, etc. in them. You can additionally attach scuba accessories and gear at the various D-rings. The Ranger has 6 steel D-Rings for that purpose. Four of them are found on the shoulders and two on the vest. The whole BCD is designed for maximum flexibility. This is not only the case for the large variety of configurations (one or two bottles, setups for tropical or cold-water diving, etc.) but also to allow to fit the BCD to you like a glove. The Ranger has a Personal Fit System (PFS) that allows you to adjust pretty much any element of the harness and BCD until it fits you perfectly. With regards to adjustments it provides shoulder straps that can be adjusted, a sternum strap that is adjustable in dual positions and an elastic cummerbund. All buckles have side releases where you simply squeeze to open them. You will typically find the best prices for the Zeagle Ranger BCD online and specifically on Amazon. You’ll be able to find different color setups and sizes based on your needs. At times you can also find combination packages of the BCD with an octo or a regulator. Check these out to save a bunch of money! There is basically nothing negative being said about this BCD by anyone owning and using it. The only complaint you can find is that it is somewhat bulky and doesn’t travel easily. Otherwise, divers are able to adjust it to their needs and body and it performs without fail. Positive remarks are always centered around the flexibility and the toughness. If you’re willing to overlook the somewhat hard time you'll have packing the Zeagle Rangerthe ﻿ BCD for travel then you don’t have to look any further. This is the BCD that others have to compete with. The flexible setup allows it to grow with your needs over the years. And yes, it will be able to grow with you as it’s built sturdy and with tough and high-quality materials. Start with a single tank setup and later switch to dual tanks. It also has many other configuration abilities that you will appreciate over the course of years to come. BCD’s traditionally had been designed for men. This often made them uncomfortable to wear for women even if they used small sized versions. Over the years more and more labels introduced BCD’s specifically designed for women. Usually, they differ in length, width of shoulder straps, cummerbund, etc. A women’s BCD needs to be easy to handle on the surface and easy to adjust to get a snug/perfect fit. In addition it certainly needs to be stable and easy to control in the water. This does also mean that a specific BCD is the best for one woman but not necessarily for another. It depends on size, adjustment abilities, weight, etc. Last but not least, it depends on personal preference. So, to say that there’s a Best BCD for w﻿﻿om﻿﻿en might end up not being the case. There are a number of great BCD’s but the best of those you will have to find for yourself. You will get closer to finding your best BCD by taking the following criteria/suggestions into consideration. Make sure to look for BCD’s that have a number of different sizes. That’ll make it easier to find a matching size that will fit perfectly. Check the sizing charts for each BCD as a large size women’s BCD probably matches a small or even an X-small men’s size! If the BCD has an integrated weight system then you want to make sure that you can easily ditch the weights if you need to. Most BCD’s with integrated weight systems have mechanical latches to ditch the weights if necessary. Any BCD needs to be able to produce lift through an air cell to counteract the integrated weights. The lift usually depends on the size of the BCD and for most starts at 25’ish pounds. No, these are not really ‘remote’. Remove valves simply means that there are exhaust valves on the BCD that are on different locations than the primary valve on the shoulder. Most BCD’s have two of these remote exhaust valves. If you end up in too rapid of an ascent then you can overcome it by bleeding air through these valves. The following BCD’s are designed specifically for women and received overall good reviews. They are from name-brand companies that produce high-quality and reliable scuba gear. The Zeagle Zena is a lightweight back inflated BCD. Its low weight and the ability to be folded makes it a great BCD for travel. The Zena features an innovative zip-jacket system. 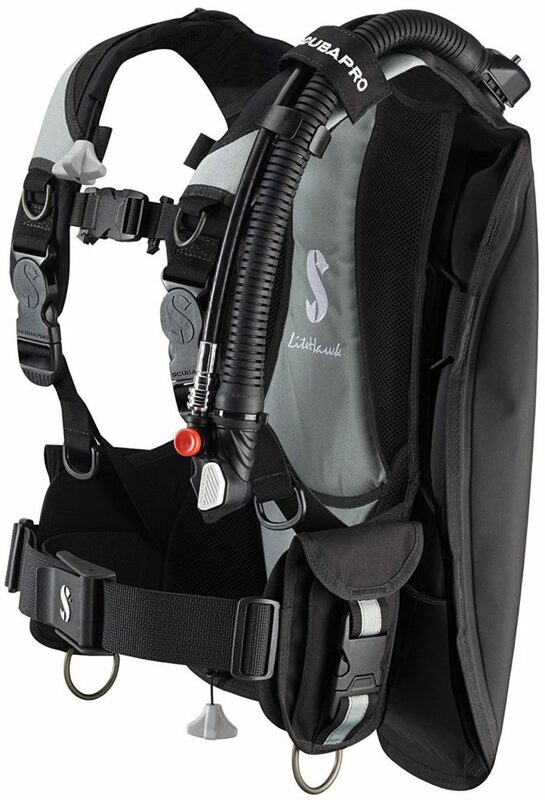 This system has the front panel of the BCD attached to the back panel with adjustable straps. You adjust those straps once you put the BCD one and have the front zippered up to get a perfect fit. The Zena weighs 6.2 pounds. It offers four metal D-rings as well as an integrated weight system. The weight system consists of a rip cord system on the sides and non-ditchable trim pockets on the tank straps. For storage it provides a detachable and expandable mesh pocket on the front. It’s large enough to hold a dive light or to put small items in from a dive. Yet, if you don’t want to bring it then you can simply remove it. The S﻿cubapro Ladyhawk has been available for a few years now and has seen some continuous improvements and changes. It features a back inflation system and is designed specifically for women. It offers padded shoulder and a narrow neck yoke specifically sized for women. It also has rotating shoulder buckles with a quick-release mechanism to route the straps perfectly for a snug and tight fit while still being comfortable to wear. The Ladyhawk weighs between 7.2 and 8.1 pounds depending on the size. It features four metal D-rings to attach gear and accessories to. It has an integrated weight system. The weight pockets are secured with a quick release system that allows you ditch them easily if necessary. Storage on this BCD is ok. It offers one zippered storage pouch that is large enough in size to hold a few essential scuba accessories. Oversized buckles for weights. Smaller buckles might make it easier to ditch weights if needed. The Aqua Lung Pearl is one of the best-selling BCD for women. It’s designed and shaped specifically to fit women and even sports the integrated, proprietary and patented sports bra to improve the fit and comfort. This BC is a hybrid-style system that combines the advantages of the back inflate and jacket systems. It’s a very streamlined design where even the valves are designed to be flat. All straps are easily adjustable to get you to find the perfect fit. The BC is available in a range of sizes so you can find the perfect one. The Pearl features an integrated weight system and Aqua Lung’s SureLock II weight pockets which align themselves. Ditching the weights is easy with a single pull release. The latest version of this BC has a larger zipper on the storage pockets which makes it easier to handle under water. There are two pockets to store accessories which is plenty for any BCD. You will find 4 D-Rings on this BCD but they are made from plastic. 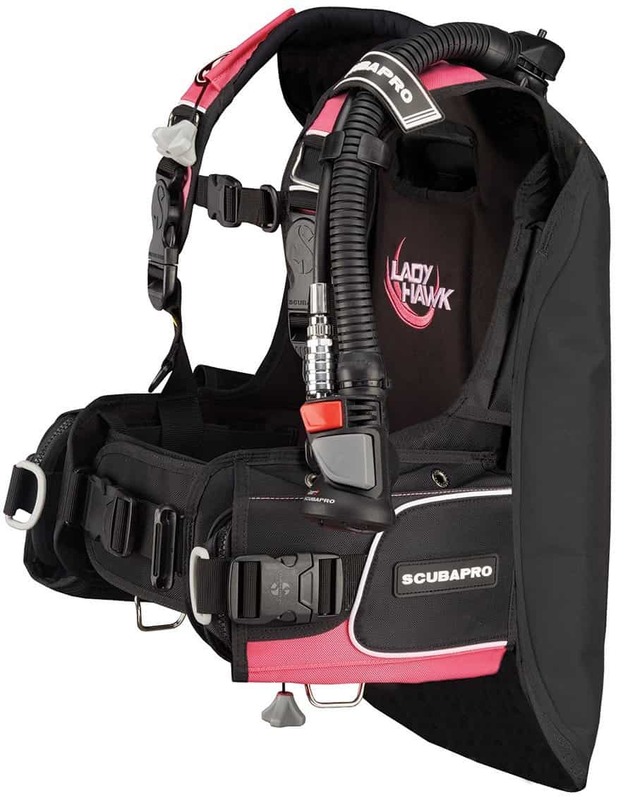 The Oceanic Hera is a compact, streamlined BCD that is specifically designed for women. It’s a hybrid BC that combines a back-inflated system with a jacket. 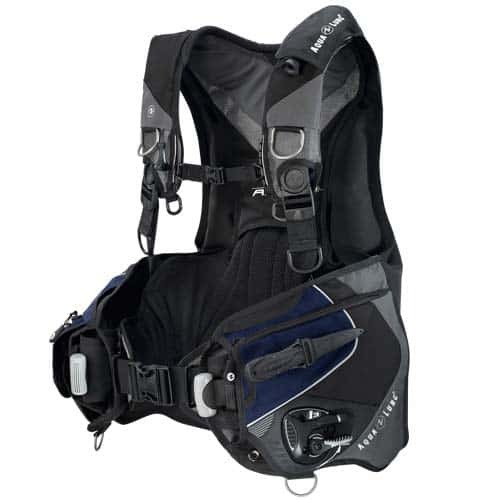 The BC features Oceanic’s patented custom fit harness. With it you can adjust the shoulder strap length and cummerbund to fit a shorter woman’s torso. The Hera has an integrated weight management system. The pouches for the weights feature mechanical latches as well as Velcro closures. Both are easily unlatched if you need to ditch the weight yet are also very securely linked to the BC. There are two rather large pockets on this BC. They close with zippers so any accessories you place in them are secure. The pockets are large enough so you can put your dive light, pocket snorkel, etc. into them. There are four D-Rings made out of steel which means there’s no risk that they might break. 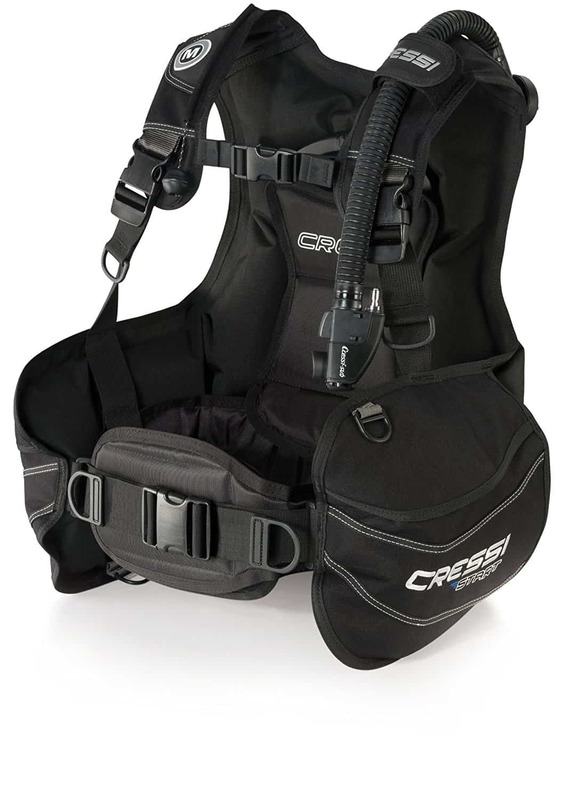 The Cressi Ultralight Lady is a back-inflated BCD specifically designed for travel and in women’s size. It’s one of the lightest, if not the lightest BCD’s you can find. It merely weighs 4.6 pounds and you can squeeze it to fit into a duffel bag that you can bring onto a flight. The Ultralight Lady is easily adjustable to get the best fit available. It features a padded back and an integrated weight system. Of all the BCD’s it’s the least colorful with only a few purple/lilac stripes on the BCD. It is a very compact built BCD and as such there’s unfortunately barely any storage space on it. The pocket is small and even the D-Rings are made out of plastic to save weight. The trade-off for being that light is that you miss on some heavier and higher quality accessories and attachment points. Yet, for travel this is the BCD to use! There is no one-size-fits-all when it comes to BCD’s for women. That is true for both men and women. Women might even have a harder time to find the perfectly fitting BCD. However, all the ones listed above will allow you to feel comfortable under water and on land. You want to make sure that you get a BCD that is the right size for your body. Then adjust it to fit for you and you should end up feeling secure and good with any of these BC’s. We’d love to hear from you and your experiences. Please leave a comment below and share your personal experiences and your personal picks for the best BCD for women! The Zeagle Scout BCD has been around for a while. It is a lightweight system which makes it perfect for travel. 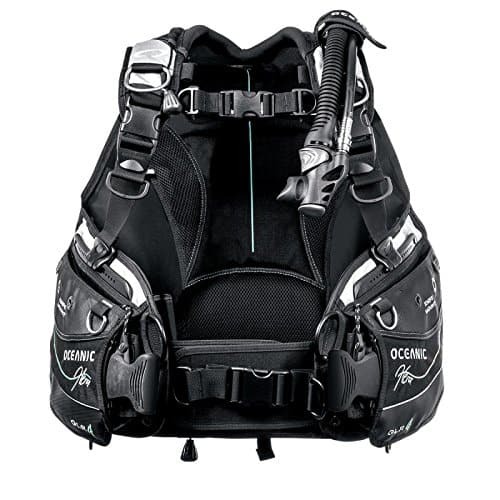 Even though this BCD is light in weight, it is sturdy and built with highest quality materials. The Scout is designed as a low-profile back inflated BCD. It consists of a single air bladder in the back. You also find the integrated weight system in the mid to lower back. 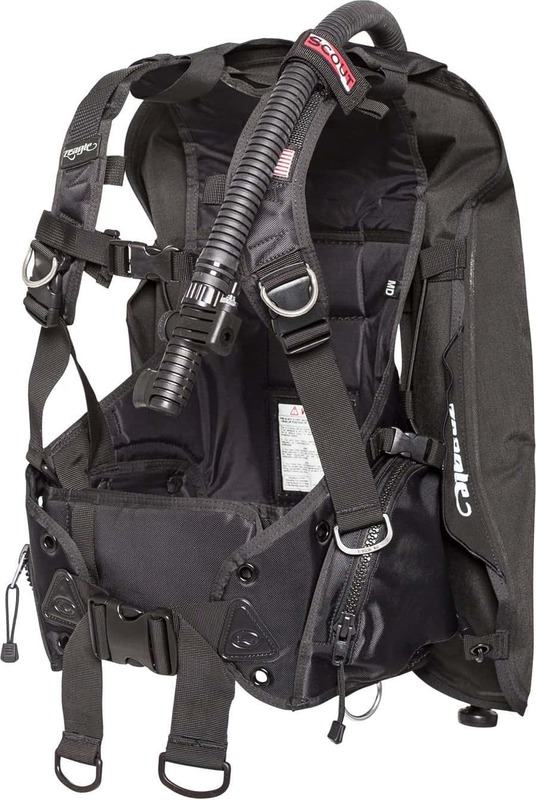 Very affordable BCD for the features provided. The Zeagle Scout BCD is easy to use and transport. Its low profile build and light weight make it a great choice for travel and warm water diving. It offers sufficient storage space and has a built-in weight system. The material quality is of highest standard which will make it your BCD for the next years to come. The only downside is that the weight system is positioned in the back which does not allow you to reach the weights and ditch them if necessary. Pricing is very competitive and you will have a hard time finding a cheaper BCD in this class. The Zeagle Scout is best used for warm environments and for travel. It’s low in weight and offers a low-profile design. The single air bladder is in the back. The integrated weight system is found in the middle-lower back. It’s capable of storing up to 16 pounds in the weight pockets. This is unfortunately a rather bad place for keeping all the weight on this BCD. There is no way for a diver to reach the weights if they’d have to be ditched. In case of an emergency it would thus either have to be your dive buddy that can remove them or you’d have to drop the whole BCD. It’s understood that this should never happen but it is something you might want to consider. You might want to at least have some weights in the storage pockets or use a weight belt. Both are easy to reach if you had to. Lift capacity on this BCD is 24 lbs. The dry weight of this BCD is 6.7 pounds. A nice feature is that you can fold the BCD down so it’s a compact package for traveling. The Scout has Zeagle’s Bx power inflator system. 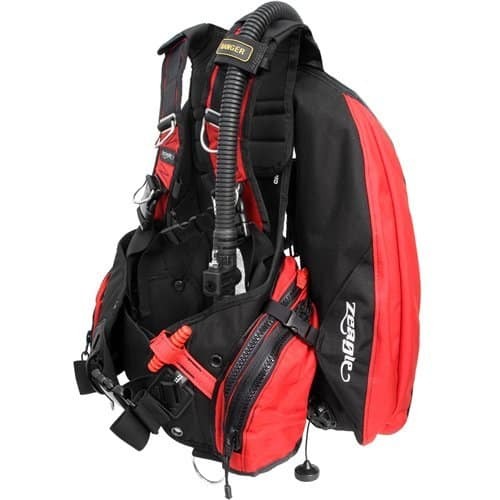 It’s been used on many of Zeagle’s BCD’s and has received high praise from many divers. It is super easy to clean as you can hook up a garden hose to rinse out the bladder. There’s no need to try to get fresh water through the mouth piece of the inflator. You can simply rinse it out and clean it with the garden hose. The inflator comes with a 3/8” low pressure hose. It offers a quick disconnect mechanism and you can easily attach that to the first stage regulator. Zeagle’s Scout offers sufficient storage capacity with two rather large pockets that close with zippers. There’s enough storage space in these pockets for a dive light, gloves and other small accessories. Other accessories can be attached to the four D-rings. Two of them are on the shoulders and two on the waist. They are sturdy in build so you can attach pretty much any kind of dive accessory you might need to bring. The harness offers a variety of adjustment possibilities to provide a custom fit for you. The waist, sternum and torso straps are all adjustable. The Velcro cummerbund can be adjusted to three positions to increase the overall comfort of this BCD. The straps buckles are all equipped with side releases that simply need to be squeezed for opening. This offers easy closing of the straps when you put the BCD on or take it off. Best prices of the Zeagle Scout BCD are typically found on Amazon. In addition to the base BCD you can also find a couple of ﻿﻿different packages where the BCD is combined with a regulator and/or octo. This can save you some money if you need to get both pieces of gear. 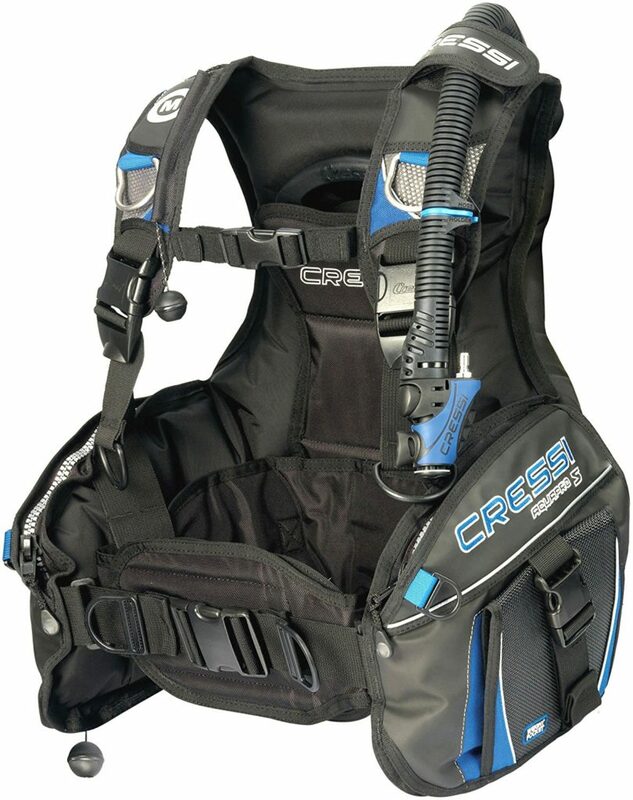 When you look at the reviews of divers owning this BCD, the feedback is overall very positive. Some complain about the cummerbund bunching up in the back or the sturdiness not being there compared to other, heavier BCD’s. The main issue there seems to be that it’s harder to put the BCD on as it’s not as stiff. However, the majority of divers that use this BCD love it. They love the compact size and low weight which makes it easy to travel with. If you’re looking for a reliable, high quality BCD which you can take with you on your travels then the Zeagle Scout is a great choice. It will be your dive companion for years to come and will not let you down. It offers all the features you’d expect of a BC and really has no downsides. The only criticism is based on the location of the integrated weight system. It’s positioned in the back which makes it unreachable during a dive. If you need to ditch weight you will have your dive buddy take care of that. You can get easily around that by using the two pockets to store weights or by using a weight belt. A BCD (Buoyancy Control Device or short BC) is one of the essential pieces of dive equipment there is. You can rent it in dive stores or simply get your own. As it is one of those parts of equipment that could end up a bit of adjustments to fit perfectly right, it does make sense to get your own so you won’t have to fiddle with all the straps to get it to sit comfortably. There’s also a safety concern when you rent these types of equipment. If you’re not used to a specific BCD and you are not 100% sure where which other parts of equipment are then you might have a hard time finding for example your dive console or dive knife that are attached to the BCD. While that’s not a problem when everything is calm, it can be a safety hazard when there’s an issue and you and your surroundings are in a sort of panic mode. It makes sense to own your essential pieces of equipment so you are used to them and know how to handle them in case of an emergency! In any case, let’s have a look at the different types and styles of BCD’s. We also added our top pick of BCD for each category to make it easier for you to choose the best BCD for your needs. 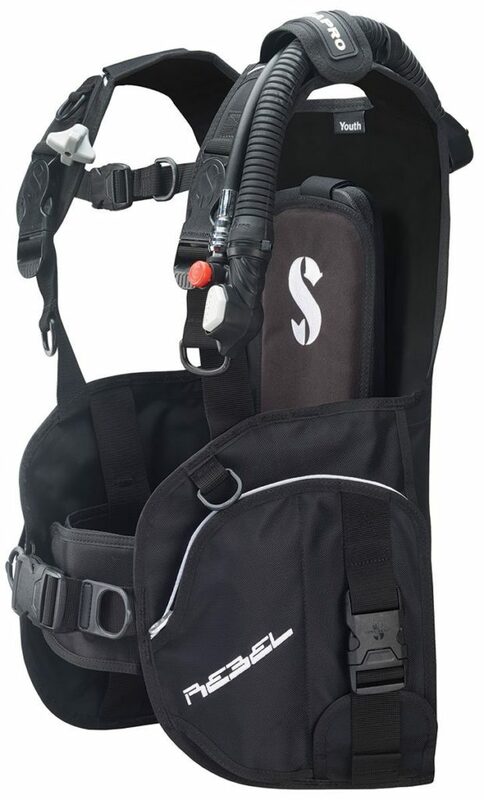 This style is the most common and most used Scuba BCD type. If you’re going to any dive shop or rental place you’ll find tons of those around for rent. They are the simplest BCD’s to use. Not that they are not good. You strap a single tank on, hook up the inflator and then adjust a few straps and it should sit safe and reasonably comfortable. The next thing is to get right in the water. Simple. If it’s your own you might fiddle more with the adjustments and hooks to put everything where you want it to be and to make sure you find all items when you need them. Most jacket/vest BCD’s are very affordable. Other options you can find are whether you want them to have integrated pouches for weights or not. If you don’t like a weight belt then definitely go for a BCD that has the weight integrated! The jacket-style BCD’s also provide numerous pockets for storage. One thing that all jacket BCD’s have in common is that the bladder wraps around the diver. It inflates in the front, the sides and the back of the diver. This overall makes them easy to handle and to adjust under water. They are very stable in any position in the water. Yet, the simplicity does have some drawbacks. The simplicity makes them perfect for new divers or recreational divers that only occasionally dive. The downside of this style is though that there’s no chance of it growing with your needs and experience. They are designed to handle a single tank and that’s it. If you ever get to the point that you want to dive with multiple tanks with different gas mixes then you’re out of luck with this type of BDC. Having said that, you can get them at a price point that completely justifies to get one to start. You’ll realistically need a while before you reach the point that you want or need more than one tank and by then the BCD might have served its purpose! The Back Inflated BCD is a variant of the Jacket type. The main difference is that the bladder that inflates is on the back instead of all around the diver. This frees up the front and allows for better movement and ends up being more comfortable. The stability of the harness comes from a strap or cummerbund around the waist line. There are usually multiple attachment point on the harness to link devices or storage to. The positioning of the bladder on the back also allows many of these BCD’s to be modular which means they can grow with the increased needs when gaining experience as a diver. Some have pockets for storage in the front of the BCD without adding any bulkiness. Many of these types of BCD’s are also designed to be light-weight for travel. That is due to these designs being usually a soft backpack. The stability is created through the bladder cradling the tank. Usually, these designs also have two straps to hold the tank. The soft backpack design makes it so that many can be easily folded up to be fit for travel. Most of the available back inflated BCD’s are also usable in both cold and warm water. The back inflation BCD needs a little getting used to when diving with it. The buoyancy is different than with a jacket BCD. Once you’ve gotten used to the different buoyancy you will feel more natural being suspended from the air in your back compared to having it wrapped around you in a jacket BCD. For a beginner diver the Back Plate and Wing BCD, also called BP/W BCD, might be somewhat overwhelming when trying to figure out what is needed. A jacket or back inflated BCD comes as a complete package. There might be some additional storage parts that you can buy but you pretty much get what you see. The BP/W system is a little more complex. You basically build your own BCD starting with a backplate. Most back plates come with the straps as part of them so at least you won’t have to worry about them. Next you add the wing (air bladder) where you have the choice between different sizes and shapes. Finally, you add the harness where you can pick different designs and colors and then certainly different hardware choices. You assemble all these into your personal BCD. This type of BDC is a great choice for more technical divers or if you want to start cave or wreck diving. A beginner should stick with simpler designs until he or she gets to the point that more technical dives with different gas mixes, etc. are required. The choices can be overwhelming and confusing. Let’s have a look at the different components. The first component is the back plate. It’s the foundation of the system. You can usually pick from three different materials which are stainless steel, aluminum and composite (plastic). You want to consider where and how often you dive before picking the material for your backplate. Stainless steel is the best choice if you dive in cold water. It also allows you add additional ballast to reduce the weight on the belt. Aluminum is a great choice if you travel often and dive in temperate environments. It is light and can easily be packed in a suitcase for travel. Due to the light construction there’s no possibility for adding additional ballast. Composites are usually the least expensive option. Similar to aluminum they are lightweight and good for travel and temperate waters. The next component to look at is the wing or air bladder. It provides the lift and buoyance for the diver. The choice is mostly based on how much lift you need. That in turn depends on whether you dive with one or two tanks, overall weight and lastly on whether you dive in warm or cold waters. It’s pretty obvious that higher weights, e.g. two tanks will require more lift. However, it’s also important to that you consider your environment. If you usually dive in cold waters then you need more lift compared to diving in warm waters. Lastly, when you look at the wing, you want to take the shape and technical features into consideration. They do come in various shapes as well as different designs. You can get single or redundant bladders, pick different locations for the wing as well as have a choice with regards to material, color and technical features like the number of relief valves. 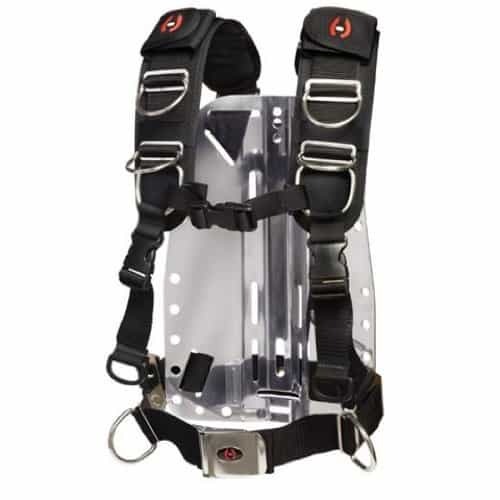 The harness and its hardware are the last components of a backplate and wing BCD. The most common choice are single piece harnesses. They work well and reliable and are long lasting. On top of that they are reasonably inexpensive. There certainly are also higher end varieties that offer padding on the shoulders or have quick release buckles. These do overall offer more comfort and have more ability to be adjusted but typically are also more expensive. Sidemount systems are the latest variant of BCD’s to be available. As the name indicates the tanks with these BCD’s are mounted under your arms instead of on the back. This mounting option was first used in cave diving as it allows to maneuver tight areas. Technical divers then took these BCD’s and used them to get rid of the heavy double tanks on their back. In the meantime more and more divers are considering or using a sidemount BCD when diving recreationally. Most lower priced sidemount systems work great when diving with a single tank or with aluminum tanks. When using steel tanks with a dry suit you’re best of using smaller tanks. These smaller and more minimalist sidemount BCD’s are a great choice when travelling or for diving in warm environments. They do not use much space but they also do not provide the necessary support and adjustments you might need when diving with a drysuit and large steel tanks! There are also higher-end sidemount BCD’s hitting the market which are designed to be used in colder climates and with large steel tanks. These are also the systems that you’d look at for cave or technical diving. 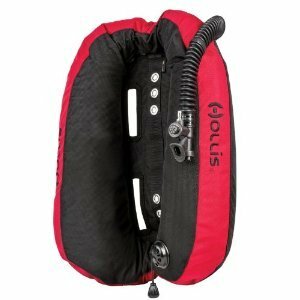 You can find sidemount systems in this category that not only support side mounted tanks but additionally back mounted tanks. Travel BCD’s are not really a specific type. You would categorize a BCD that is easy to travel with. So, they would be light, easy to fold and fit into a suitcase without a problem. There’s no exact definition of what makes a travel BCD but the three criteria above would describe it pretty well. Many modern travel/compact BCD’s weigh so little that you can fit them in a carry-on bag in the plane! 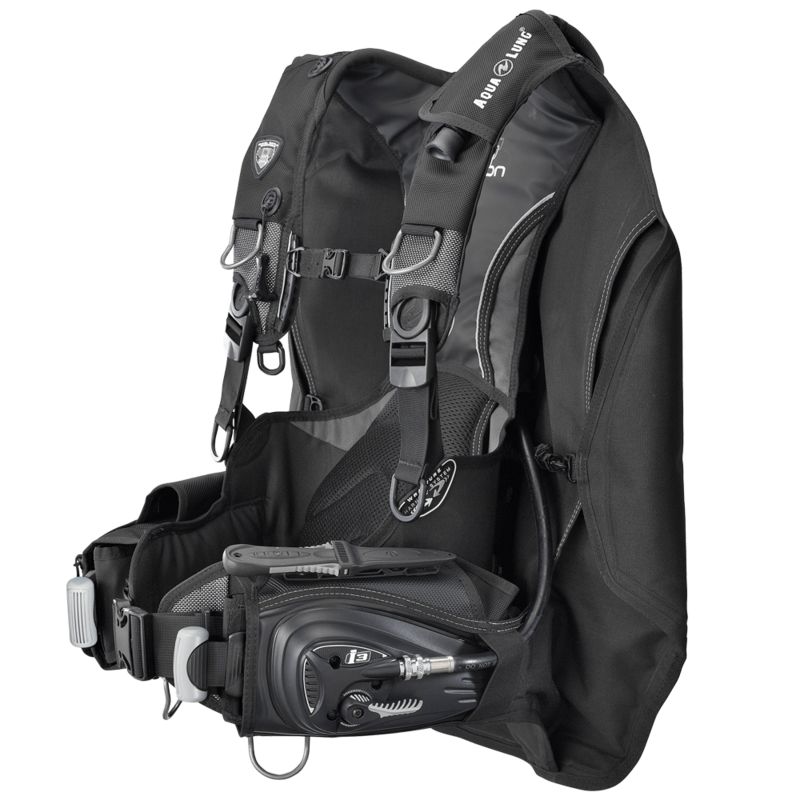 Having such a compact and light-weight BCD does not only have advantages. There are some downsides as well. First, these smaller BCD’s usually have a lower lift. That makes sense as the trip often (mostly) ends up in a warm destination. Warmer environments mean that you’ll use aluminum tanks and as such the lower lift is acceptable. Next, these types also have a low buoyancy. To reduce the weight and bulkiness, they have less padding and are overall a little lighter than a regular BCD. That results in less weight being needed for them to sink. The number of women that take up scuba diving is rising all the time. That also caused the manufacturers to design BCD’s that specifically are fitted for women. These three design specifics allow the BCD’s to fit a woman’s body better and make it more comfortable to wear and dive. There’s not that much to choose from when you’re specifically looking for a kids BCD. 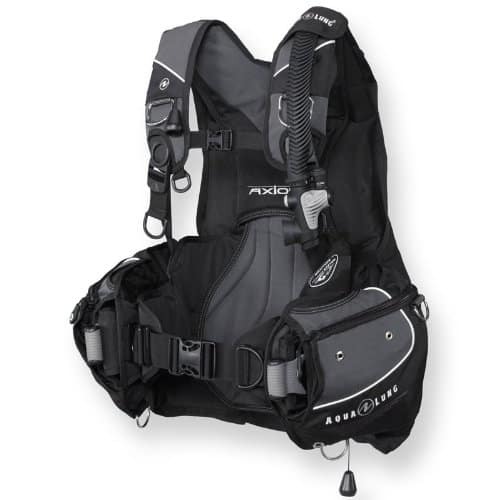 Many BCD’s have a XS sizing option that often fits children. Otherwise, look at specific kid BCD’s which are really nothing else than smaller versions of adult BCD’s. They are shorter. They also provide less lift as they don’t need that much. Alternatively, you can also get a short backplate and build a BP/W system for your child. That can end up more complicated than simply buying a BCD but you can get one that perfectly fits your kid until he or she grows out of it. There are quite a f﻿﻿ew types of ﻿﻿BCD’s to choose from. Ultimately, there’s no perfect choice that suits everybody. Many, if not most recreational divers will be perfectly happy to use a jacket or back inflated BCD. Technical divers prefer the BP/W design or the sidemount BCD’s. If you’re into cave or wreck diving then you definitely want to have a closer look at a sidemount type. You should ask yourself what kind of diving you’re realistically going to do over the next few years. If you can rule out technical, cave or wreck diving then there’s no reason to go and get a sidemount or BP/W type. Next you need to figure out whether you want a BCD that’s capable of having weight integrated or not. Quite a few divers are very happy to not wearing a weight belt and as such need a BCD that has pockets for weights. Leave us your comments below and please share your experiences. We love hearing from you!